As	transportation	agencies	continue	to	search	for	different	ways	to	not	only	provide	transportation	options	for	all	communities,	but	also	hope	to	finance	larger	infrastructure	projects	responsibly,	it	is	important	to	look	to	cases	that	tackle	both	issues	head	on. Many	urban	professionals	have	deemed	the	implementation	of	the	FasTracks	project	to	be	a	large	success	in	the	field. These	observations	call	for	investigation	of	the	University	of	Colorado	A	Line	commuter	rail,	the	first	full	transit	Design	Build	Operate	Finance	Operate	Maintain	(DBOFM)	PPP	in	the	United	States	to	understand	if	the	project	has	been	deemed	successful	or	not	in	the	eyes	of	those	that	use	it	most	frequently;	the	people	of	the	metropolitan	region	with	a	special	focus	on	social	justice	when	understanding	the	PPP’s	performance	metrics. In	order	to	increase	success,	scholars	and	urban	practitioners	involved	in	PPPs	find	social	justice	important	to	look	at. 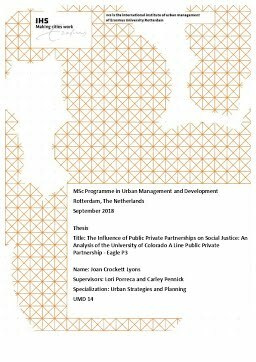 The	main	objective	of	this	study	is	to	understand	if	PPPs	can	generate	different	outcomes	that	reflect	social	justice	values	and	aims	to	explain	what	actions	within	a	PPP	framework	are	most	relevant	to	social	justice. This	study	utilized	the	mixed	methods	approach. In	order	to	determine	the	factors	that	generate	social	justice	values	from	all	perspectives,	the	following	methods	were	utilized	in	data	collection	and	analysis:	1. Existing	reports,	documents	and	data	were	studied	from	the	project	to	understand	the	emphasis	placed	on	social	justice	indicators,	2. Semi-structured	interviews	were	conducted	with	those	most	familiar	with	the	project	to	solidify	or	challenge	social	justice	findings	from	existing	reports	and,	3. Community	surveys	were	administered	to	understand	the	public’s	perspective	of	social	justice	to	ultimately	determine	the	emphasis	of	values	in	different	portions	of	the	PPP	in	the	eyes	of	those	who	use	the	University	of	Colorado	A-Line	service	most. Findings	ultimately	determined	best	practices	and	actions	to	for	generating	PPPs	with	the	public	and	social	justice	in	mind.